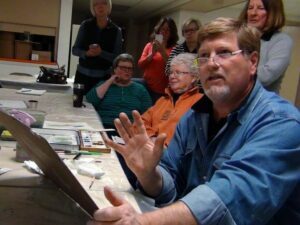 Watercolor Workshop - Trees with Dale Popovich - Land O' Lakes Area Artisans, Inc. Learn to paint the structure of trees in Watercolor with award winning artist, dale popovich. EVent location changed to ely memorial church – just down the road from the lola center. see location below. During the first half of the day, Dale will demonstrate various trees of the Northwoods. The afternoon will be a paint along using some of these trees in a composition. Students will be given photo references for the day. Dale L Popovich. Observer. Artist. Watercolorist, is an award-winning watercolorist and teacher who is passionate about capturing the raw beauty of the American landscape with the fluid stroke of a brush. Spending his childhood summers in the Northwoods of Wisconsin, Dale learned to love its colors, textures, denizens, and moods – developed his holistic approach to watercolor. Today, his paintings celebrate these American landscapes and man’s humble efforts to tame it. Currently, Dale teaches at the prestigious Palette & Chisel Academy of Fine Arts in Chicago. The Palette & Chisel is an association of representational artists, founded in Chicago in 1895, is the second oldest artist organization in the United States. He also teaches at Mainstreet Art Center in Lake Zurich, IL, and the Elmhurst Art Museum, Elmhurst, IL. Popovich has workshops, demos, and teaches weekly classes in his own studio in Highland. In addition, Popovich and his wife launch an online art school, ToweringWindsAcademyOfFineArts.teachable.com. Dale, his wife, Marilee and their two Pembroke Welsh Corgis live in Northwest Indiana. In addition they own a log cabin in the Great Northwoods of Wisconsin. Dale a signature member of the Illinois Watercolor Society. He is also a member of the Historic Brown County Art Galley Artists Association. His paintings and giclée prints can be seen and purchased at the Brown County Art Gallery in Nashville, IN and his online store. Deadline for payment/registration is November 13, 2018. Parking is available behind the LOLA Center for the Arts building at 4262 County Road B, downtown Land O’ Lakes, WI.